Birthdays . . .anniversaries . ..births and deaths all become part of who we are. Each of us carries a timeline of dates with stops of great importance along the way. Some dates are celebrated with friends and family and marked on the calendar with the invitation stuck to the refrigerator. Some dates are mentioned year after year. . .
mostly because it still seems not that long ago and we can't believe where time has gone. Mothers remember the birth of their children not of just the day itself but also when the birthing began. I think not only of the date when I said goodbye to my mom ..
but also when that goodbye began. I was with her and my Dad as she stopped looking into our eyes and in the next instant looked into the eyes of her Saviour. We looked at each other in disbelief that this was our new reality. I am grateful and very blessed that I had that time. As the years go by I realize what a gift that was. Sixteen years ago has flown by. I ache for her to see my children and grandchildren. If she could .. .she would be still hosting cousin camp. She'd be "dead tired". .as she often called it. .
and it still makes me smile when I think of all her most often used phrases. In the picture above .. note . . I browsed through pictures last night taking time to gaze into her brown eyes. Remembering what it was like to have my mom. Wishing I could talk to her . . Some of you are understanding what this is like. I ended up smiling at this picture of me not wanting to be photographed with chocolate cake all over my face. See . . she browned the buns on top a tad too much . See . . Velveeta cheese made it onto the table. See . . her melmac postum cup all stained and the only dinnerware I remember growing up. See . . the furnace in the background where I once asked the repairman whether he was a man or lady when he .chatted it up with my mom about recipes. See. . that on an ordinary weekday supper she wore a sparkly necklace. See .. she served us chocolate cake for dessert. Life is very short. .and incredibly precious. I had a mom who loved me .. I love your observations of the last picture. Thanks for sharing this lovely tribute. I know what it feels like to miss someone who loved you well. It is just wonderful how God has created us to keep things in our heart, to ponder on and treasure! Good thing we have photos and other memorabilia as well! To know that we are truly loved by family, friends and above all our Heavenly Father is all we need! Be blessed in your memory lane today! I watch my DIL with her two little ones and think about the love in every little detail of everything she does. I'd guess that one of your mum's greatest legacy is love. Yes Lovella...you did have a mom who loved you! I witnessed her unconditional, faithful, love for you many times. You and her had a heart connection and that does last a life time even though she is gone.....you still know how she would be in many given moments. what a wonderful post and an amazing tribute to your mother. Perhaps I was among your first readers this morning...had to tiptoe quietly out as this affected me so much. A mother's love...nothing like it in the entire world. Love the soft pink in here for it perfectly complements your parents' wedding photo. What a handsome couple! What a beautiful tribute to your mom. It brought a tear to my eye and a smile to my lips. All the people who will meet your mother today will see that eternal life means love never ends. I look forward to meeting her one day in heaven. I remember your mom's geunine smile. .. there was no pretense in her. I love the things you pointed out... funny what little things bring back memories to the one who sat there. Isn't it great to have pictures.. the few we have seem to say more than the piles we have today. What a beautiful post. And what a beautiful mother you had the pleasure of having...even if only for a while. It made me want to cry and yet I smiled too. Thank you for posting as you did...makes me want to treasure every moment with my mom that I can and let her know how much I appreciate her! Because we never know what life will bring us. Precious memories Lovella and a beautiful post. We had one that we needed a harness for (for his safety not because we were mean) How wonderful that you have all these great photos! Beautiful tribute to your Mother and such dear photos, Lovella! I thankfully still have my Mom but I have often yearned my whole life for my Father who was taken from us much too young, when I was a teenager. Mother's are blessings! 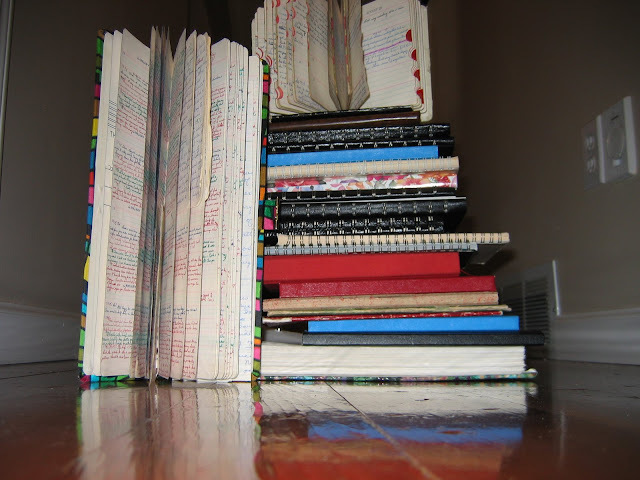 Tell us about the journals Lovella ... there has to be treasure in those as well ... your or hers? My Mom wrote in journals thru her care of my grandmother and we get them out and laugh and cry. They are precious to us now. Oh...there is never enough time with those we love and cherish. 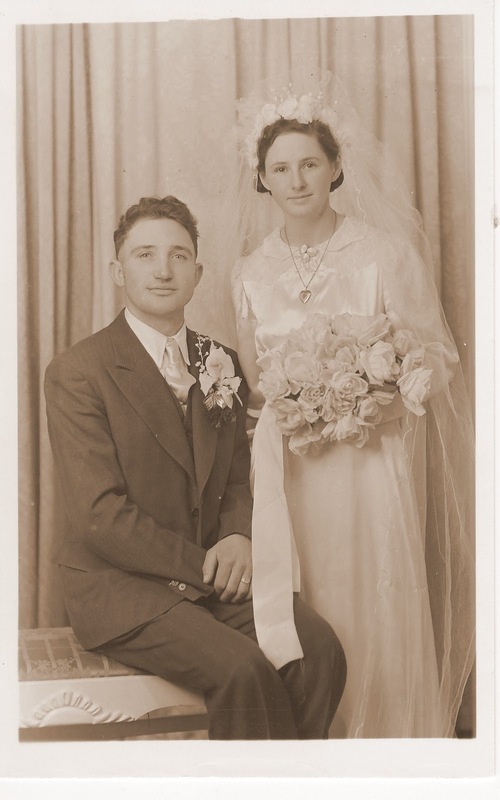 I smiled at those photos...looking and thinking of the era's when my mother looked like that. Keep spending time thinking about her legacy...it never leaves and she will cherish knowing that you are following her footsteps...She would be Oh! so proud of you...knowing that you have a heart for God and your family. Oh my Lovella. Tears here. That was very beautiful...very heartfelt! What a lovely post about a woman that I wish I could've met... you do a great job of keeping her memory alive. you got me all choked up with this one. i just came back from the airport, saying goodbye to my own beloved mom. it wasn't a forever goodbye, but this blog post struck a chord with me because i do achingly miss her now and then. thank you for the reminder to cherish every little moment and memory. p.s. i smiled to see your youngest wearing a harness. i am thisclose to buying one of those for my samuel. What a sweet and heartfelt post. The pictures are wonderful, and your observations are so touching. Your mother raised a lovely daughter. Hi! I've been reading your blog for a few years and have never posted before. Just want to tell you that when I looked at the wedding picture today, I actually thought it was you and Terry in one of those "old timey" pictures. You look EXACTLY like your mother! Light and love to you from Ohio! Beautiful memories you have! and my Mom said on Sunday how very proud your Mom would have been of all you have accomplished! What would you have said if you had been told at the time that that 'crying chocolate face' would be viewed by thousands when you were famous? smile..
Moms are the best!! I lost Mom this last December 4th.I have a life time of memories that will help me through this. But we know by our faith that we will see them again,thats what keeps us going . This brought tears to my eyes! Thanks for the sweet reminder to cherish the loved ones we have been blessed with! I don't know why, but this post made me want to cry anc cry. To cry for my own mum, who died in 1976 when she was 46 and I was 22. For the adult relationship that we never had. For my own three children who are now grown up, and for memories of their childhoods and my role as their mother. For the fact that one day I wont be here, and they will look back in the same way as I am doing now. I pray that they will look back in love, and have happy memories. Am I the only one who puts herself down and thinks she didn't do enough, or well enough? Gosh, do I sound mixed up - or what?! What a wonderful post. It brought tears to my eyes. I wish I had photos of me and my mom but it seems she was always behind the camera. There were far too few of her. She passed away from Leukemia when I was 16 years old. Taken away at the most critical time in my life. Fortunately she had left me with a faith in God and a lot of wonderful friends and family to help us along. Such and tender and fun picture. I love it. I'm only in the beginning of knowing. I did ask Jesus, when our latest grandson was born, "Jesus, if you do this sort of thing, would you please tell my mom about baby Isaac?" 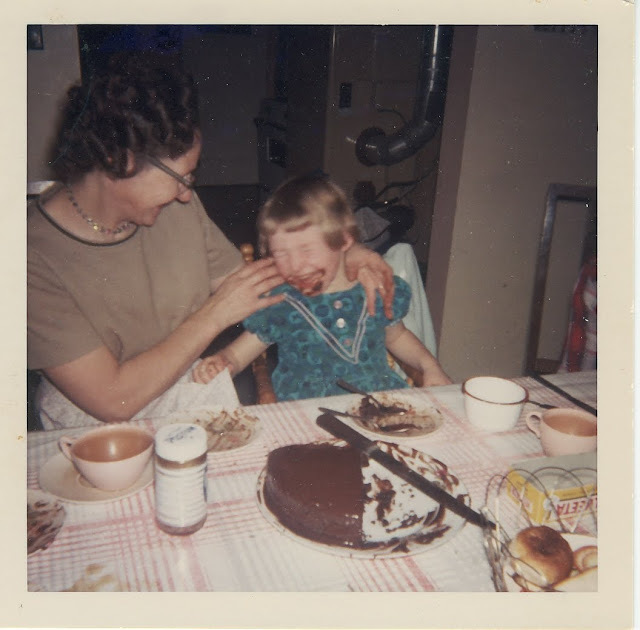 Lovella, what a tender and fun picture of you and your mom and your chocolate cake face. I'm just in the early days of missing I think. I did say to Jesus recently, after the recent birth of another grandson, "Jesus, if you do this sort of thing, would you please tell my mom about baby Isaac". The wedding photo is beautiful and your mom looks so much like you in that picture! I am sorry that you are not able to share these present days with your mom. Watching my mom grieve over the years (her parents died before I was born) gives me something of an idea of what you probably feel. 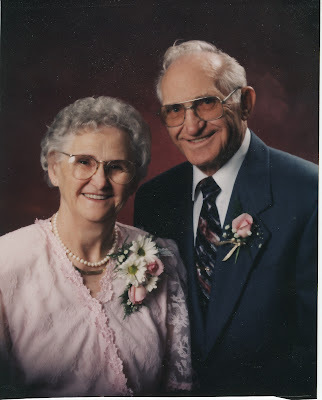 I often feel cheated out of not having gotten to know my grandparents and it is funny that I "miss" them at times even though I never met them.